Leonard, Cornelius and Cecil Trice Smith were the sons of Albert and Alice Smith of 42, De Beauvior Road, Reading. They are named on the headstone of their parents grave. 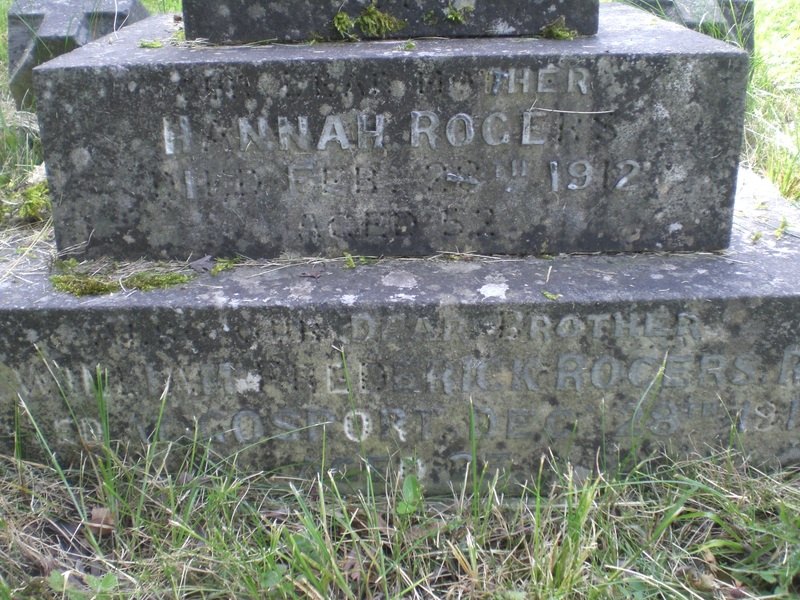 Grave number 17619. 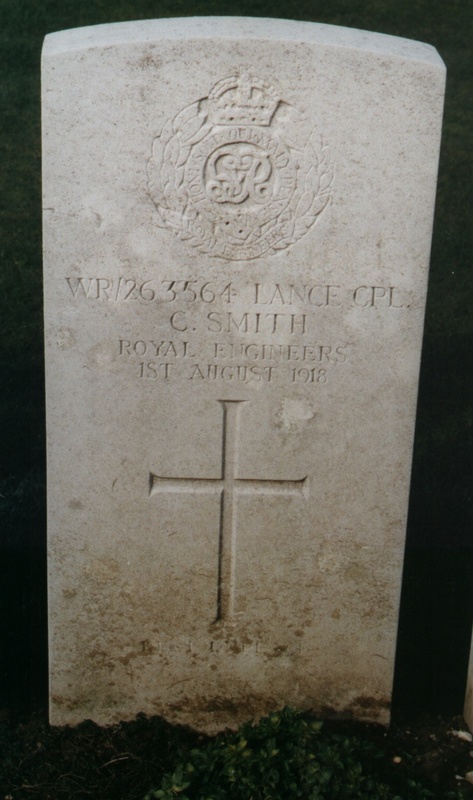 Archibald Smith, who is pictured with Leonard and Cecil is assumed to be another son and to have survived the war. The 1901 census indicates that the family were living in South Western Cottages, Basingstoke and that Albert was a train carriage examiner and son Archibald, then 14, was a boiler riveter. Cecil, the oldest at 16wasnot recorded as having an occupation. Cornelius was aged 10 and Leonard was 4 years old. They had two sisters Dorcus aged 6 and Alice 2 months. He was reported missing on 27th July 1916, and was reported to have died on or after that date. He was 19 years old. His is named on the family grave along with his brothers. 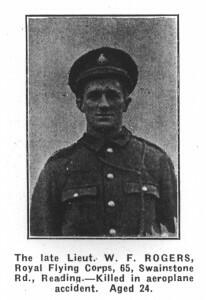 Leonard Smith is commemorated on the Thiepval Memorial to the Missing, the Somme, Pier and Face 13A & 13B. 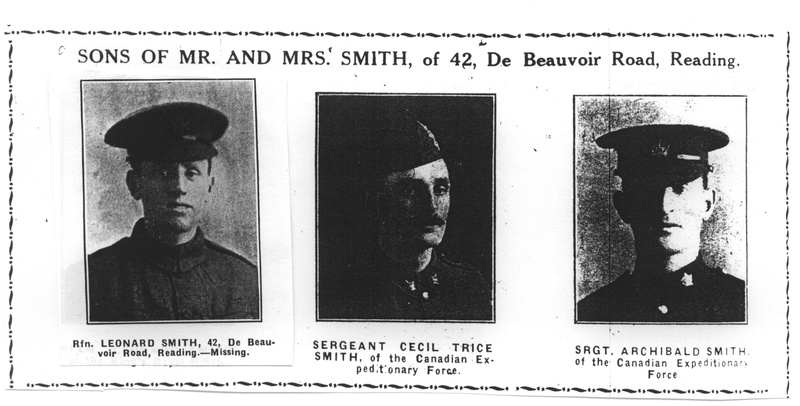 Cecil Trice Smith was married to E. M. Smith of 21 Linwood Terrace, Abingdon. He was killed in action on 9th April 1917 and is buried in Zouave Valley Cemetery, Souchez, location I.G.1. The Battle of Arras began on the 9th April. The Canadians took Vimy Ridge in a well rehearsed battle which involved the use of underground tunnels to move masses of troops unseen and close to the German trenches. Cecil Smith was killed during this action but where exactly is not clear. He is buried in Plot I of the cemetery which was made after the Armistice by the concentration of graves from a wide area around Souchez. 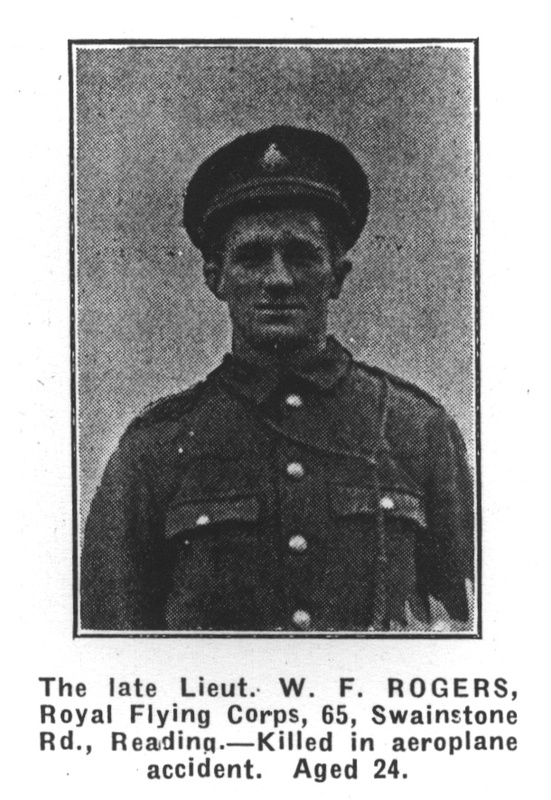 Cornelius Smith was killed an air raid on Boulogne on 1st August 1918. 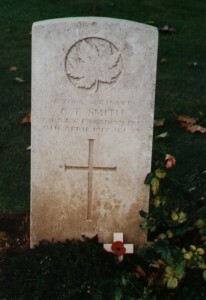 He is buried in Terlincthun British Cemetery, Wimille Plot II. A. 7. Archibald Smith is the brother of Leonard and Cecil Trice Smith. He appears on the photograph accompanying this biography. However, it has not been possible to find information about him when carrying out a CWGC search. It has been assumed by the author that Archibald Smith survived the war and his brothers, Archibald’s name does not appear on the family headstone. The Slade family grave, number 11233; Berkshire Family History Society classification 44L26, commemorates the names of five ‘Dear friends, Killed in Action’. 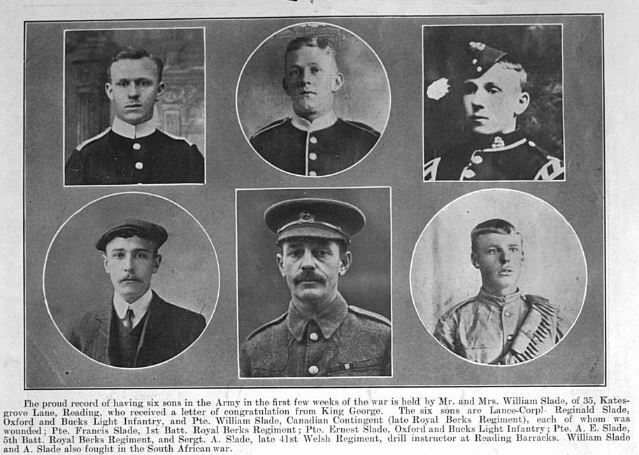 There were five Slade brothers serving in the army according to a cutting taken from the paper. In many newspaper reports the family address is given as Brunswick Street, Reading. It is known that the father also resided at 10, York Place, Reading. Alexander Alldridge, was the son of George Joseph and Edith Alldridge, of 9, Wood Street, Earlestown, Lancashire. He was killed on 13th July 1916 aged 23 and is buried at Bapaume Post Military Cemetery, Albert. Location I.E.14. Percy, who had married into the Slade family, had already served eleven years in the army when war broke out. 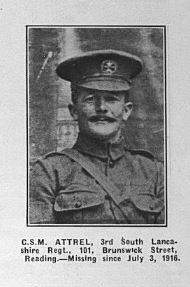 The first reports about him in ‘The Standard’, appeared in February 1915. Percy had been wounded in the right arm during the Battle of Aisne, September 20th 1914. He was sent for treatment at No.5 Base hospital and spent one week in hospital in Cambridge. His injuries resulted in tetanus and for a time he had lock-jaw, there was also a worry that he would loose the use of three fingers on his right hand. However, he obviously recovered because he was posted as missing on July 3rd 1916. His wife, Edith, was seeking information about his whereabouts through out September 1916. Later the reports also included A.E. Slade . Albert E. Slade lived at 101, Brunswick Street, Reading. 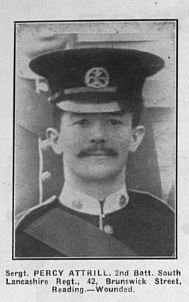 He died on the 23rd July 1916. He is buried at Delville Wood Cemetery, Longueval, Somme. Location XXII. H.5. At the time of the 1911 census the family were recodedasliving at 60, Weldale Street. Albert was recorded as widower and a printers labourer,specifically a stone cleaner. His brother Ernest was recorded as an engine cleaner for the railways and brother Reginald worked in the tin factory making biscuit tins. 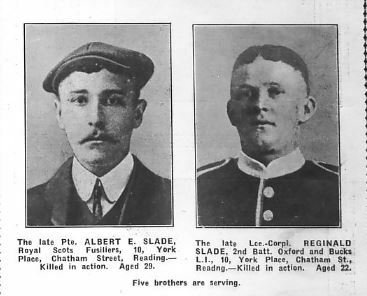 Albert Slade was remembered by his father, brothers and sisters in ‘In Memoriam’, Reading Standard, 20th July 1918. But sorrow beneath a smile if oft concealed. S.Slade lived at Old Didcot. He died on the 19th April 1918. He is buried in the St. Sever Cemetery Extension, Rouen. Location P. XI. L. 10B. Lance Corporal Slade died as a result of gas poisoning at No.3 Stationary Hospital France. He was the youngest of the Slade brothers.